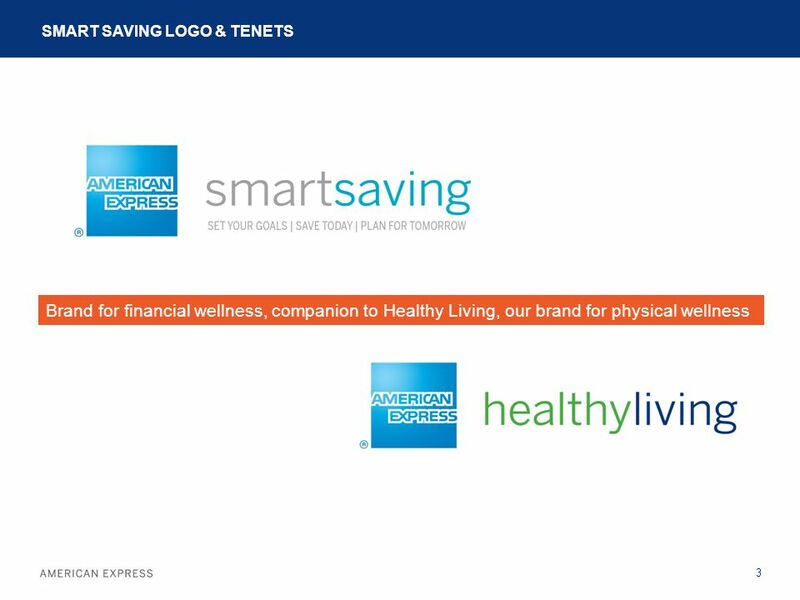 Building Financial Wellness at American Express with Smart Saving Financial Literacy Leadership Conference October, 2012. 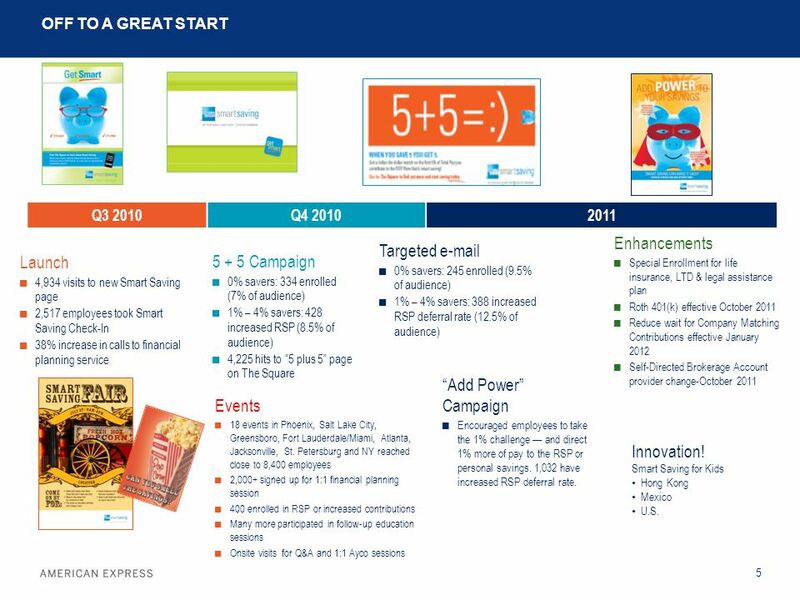 5 5 Process Step OFF TO A GREAT START Q3 2010Q4 20102011 Launch ■ 4,934 visits to new Smart Saving page ■ 2,517 employees took Smart Saving Check-In ■ 38% increase in calls to financial planning service 5 + 5 Campaign ■ 0% savers: 334 enrolled (7% of audience) ■ 1% – 4% savers: 428 increased RSP (8.5% of audience) ■ 4,225 hits to “5 plus 5” page on The Square Targeted e-mail ■ 0% savers: 245 enrolled (9.5% of audience) ■ 1% – 4% savers: 388 increased RSP deferral rate (12.5% of audience) Enhancements ■ Special Enrollment for life insurance, LTD & legal assistance plan ■ Roth 401(k) effective October 2011 ■ Reduce wait for Company Matching Contributions effective January 2012 ■ Self-Directed Brokerage Account provider change-October 2011 Innovation! 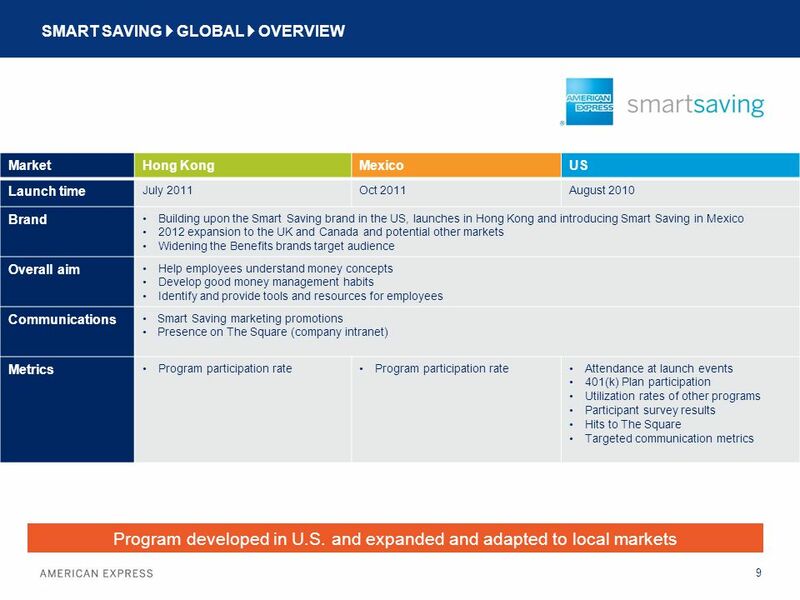 Smart Saving for Kids Hong Kong Mexico U.S. Events ■ 18 events in Phoenix, Salt Lake City, Greensboro, Fort Lauderdale/Miami, Atlanta, Jacksonville, St. Petersburg and NY reached close to 8,400 employees ■ 2,000+ signed up for 1:1 financial planning session ■ 400 enrolled in RSP or increased contributions ■ Many more participated in follow-up education sessions ■ Onsite visits for Q&A and 1:1 Ayco sessions “Add Power” Campaign ■ Encouraged employees to take the 1% challenge — and direct 1% more of pay to the RSP or personal savings. 1,032 have increased RSP deferral rate. 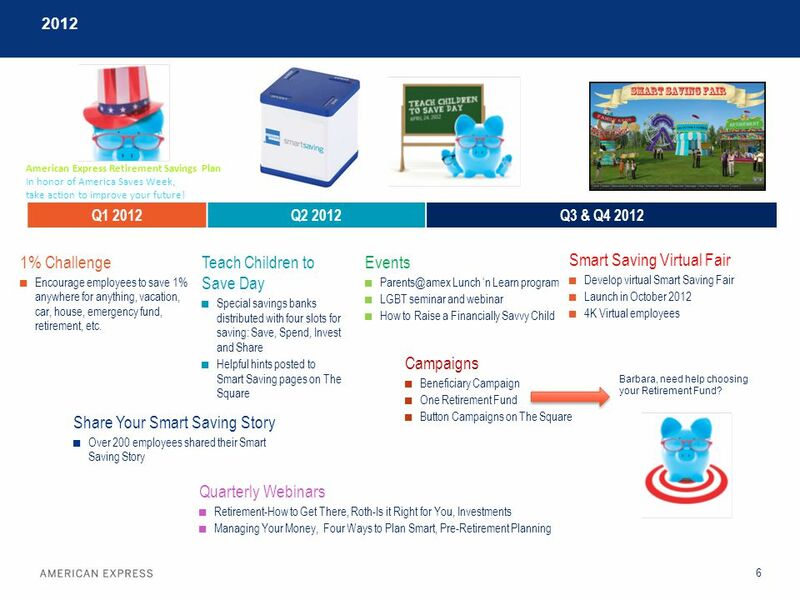 6 6 Process Step 2012 Q1 2012Q2 2012Q3 & Q4 2012 1% Challenge ■ Encourage employees to save 1% anywhere for anything, vacation, car, house, emergency fund, retirement, etc. 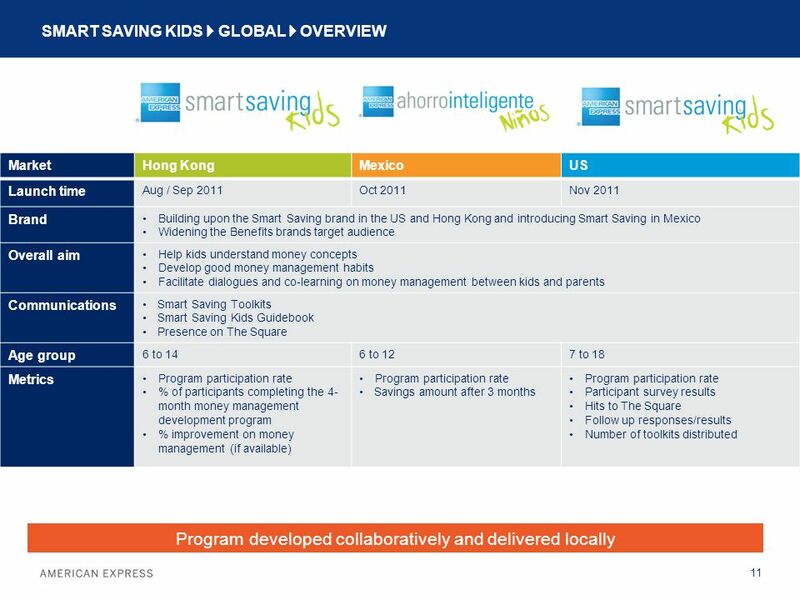 Teach Children to Save Day ■ Special savings banks distributed with four slots for saving: Save, Spend, Invest and Share ■ Helpful hints posted to Smart Saving pages on The Square Events ■ Parents@amex Lunch ‘n Learn program ■ LGBT seminar and webinar ■ How to Raise a Financially Savvy Child Quarterly Webinars ■ Retirement-How to Get There, Roth-Is it Right for You, Investments ■ Managing Your Money, Four Ways to Plan Smart, Pre-Retirement Planning Smart Saving Virtual Fair ■ Develop virtual Smart Saving Fair ■ Launch in October 2012 ■ 4K Virtual employees Share Your Smart Saving Story ■ Over 200 employees shared their Smart Saving Story Campaigns ■ Beneficiary Campaign ■ One Retirement Fund ■ Button Campaigns on The Square Barbara, need help choosing your Retirement Fund? 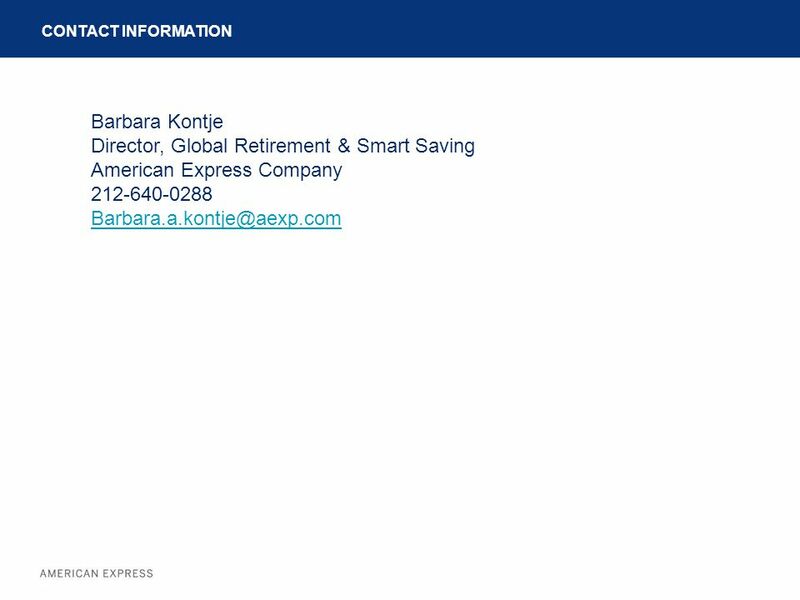 American Express Retirement Savings Plan In honor of America Saves Week, take action to improve your future! 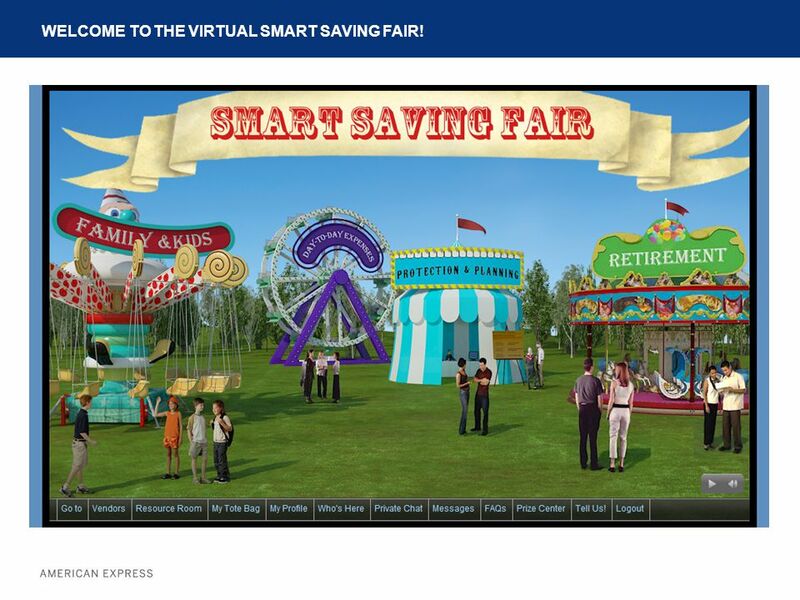 8 WELCOME TO THE VIRTUAL SMART SAVING FAIR! 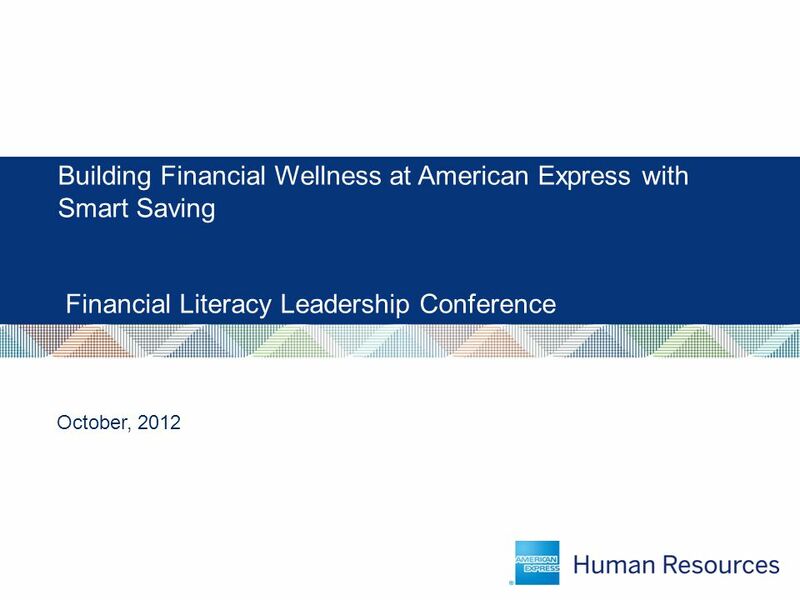 Download ppt "Building Financial Wellness at American Express with Smart Saving Financial Literacy Leadership Conference October, 2012." Assets in the Workplace Ellen Seidman Director of Financial Services Policy Asset Building Program New America Foundation Invitational. © 2010 AT&T Intellectual Property. All rights reserved. AT&T and the AT&T logo are trademarks of AT&T Intellectual Property. Your Money Matters at AT&T. Campaign Basics 101. WELCOME & INTRODUCTIONS Your Name Your Company Your Role What are you hoping to learn today? Creating the Merchant Value Proposition for Electronic Payments October 17, 2012. 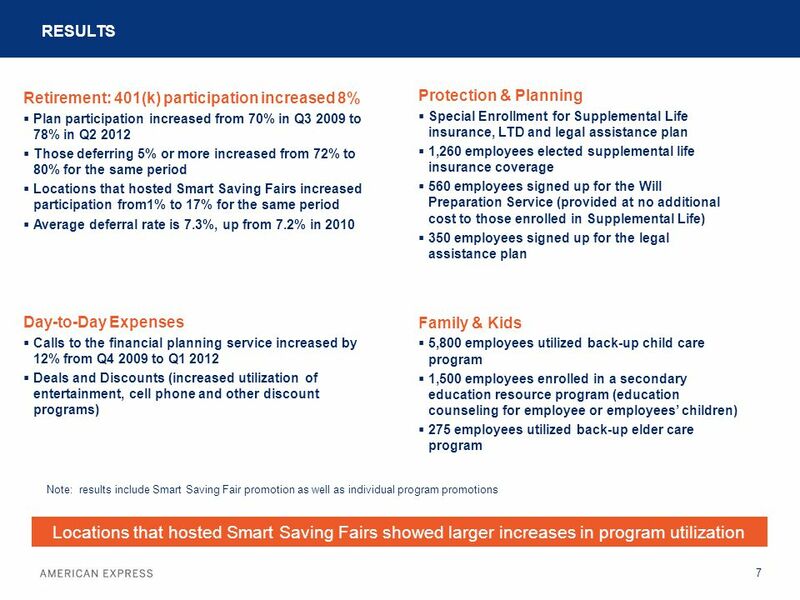 Healthy Indiana Plan Hoosier Innovation: Health Savings Accounts 1992: Hoosier pioneers medical savings accounts 2003: Tax advantaged HSAs authorized. Faculty Senate SEPTEMBER 19, 2012 Pending Board of Trustee Approval HR-Benefits-update-9/19/12-FS agenda1. Making money out of loyalty 22 ND APRIL, 2014 / TERO TASKILA. 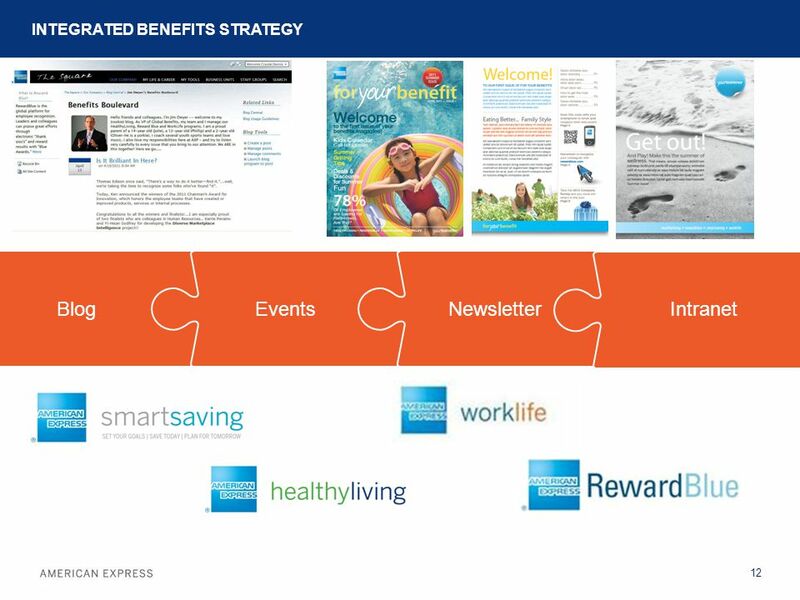 Agenda TurboTax Overview TY13 Enhancements – Military Edition Benefits of TurboTax for your CU Marketing Timing Marketing Strategies Next Steps 2. Personal Marketing: A Strategy for Marketing Programs to Diverse Audiences Dallas L. Holmes, USU Extension Adapted from an article by Lisa A. Guion, Florida. Bank Atlantic Banking/Credit Cards Research Project. Welcome IU Students. 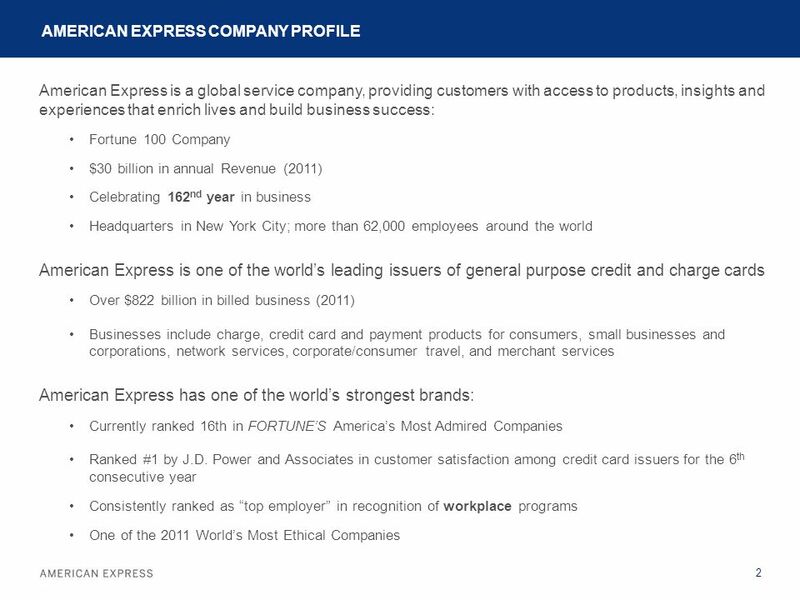 The Next Stage We help customers meet their financial goals We are a 16.4 billion dollar company We have been in the Consumer Finance. Financial CHANGE Program 2010 – 2011 COACH TRAINING October 12, 2010. Building Bucks Taxes and Tax Credits. Take advantage of tax deductions and incentives – Earned Income Tax Credit (EITC) – Child Tax Credit (CTC) Refund. Consumer Action Families and Credit Cards American Express Families and Credit Cards A project of Consumer Action and American Express © Consumer Action. 1 The Go Direct ® campaign and the Direct Express ® Debit MasterCard ® card December 3, 2009 The Go Direct ® campaign is sponsored by the U.S. Department. 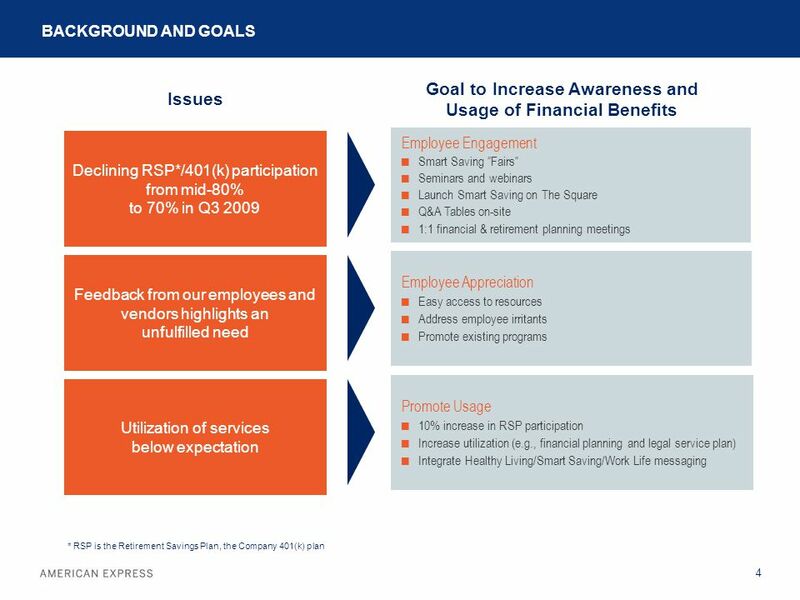 Why is Financial Education Important in Texas? TCEE Smarter Texas Conference Leilani Lim-Villegas Financial Education Coordinator Texas Department of Banking.